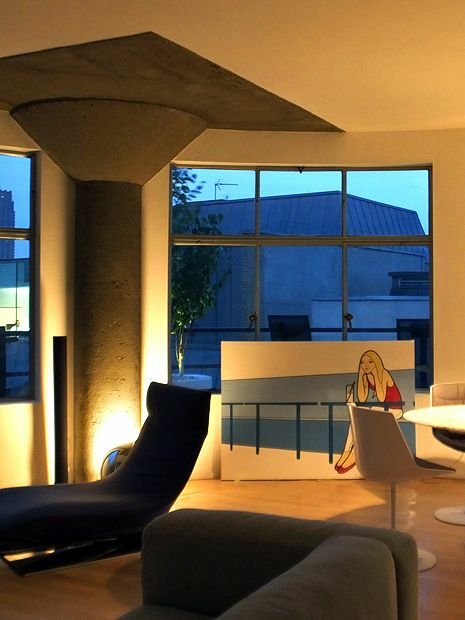 Curving around the Ziggurat Building, an 8-floor Farringdon Art Deco residential landmark, this 30-square-metre contemporary roof terrace contemplates an architectural perspective of a definitively clustered London skyline. Cocooned on the sixth floor, along an awe-inspiring 270-degree panorama above a busy EC1 turning, the terrace links our client's innovative interior into a buoyant city landscape with poised minimalism. 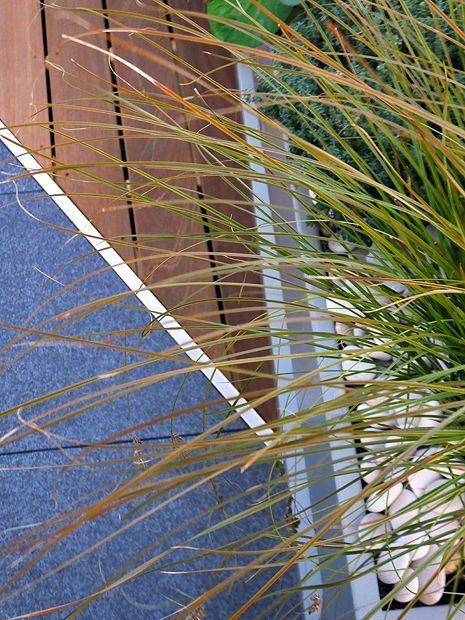 Accompanied by esteemed landscape photographer Clive Nichols, we visited our client for a little chinwag, and took snaps of this roof terrace project for the teNeues publication ’Living Roofs’. Sensuously curved, compactly outlined and minimally designed, this Farringdon roof terrace surveys an emergent urban azimuth, where an oversized kitchen utensil, a pickled vegetable and a jumbo portable radio are extraordinarily juxtaposed with neighbouring Clerkenwell's quaintly medieval landscape. 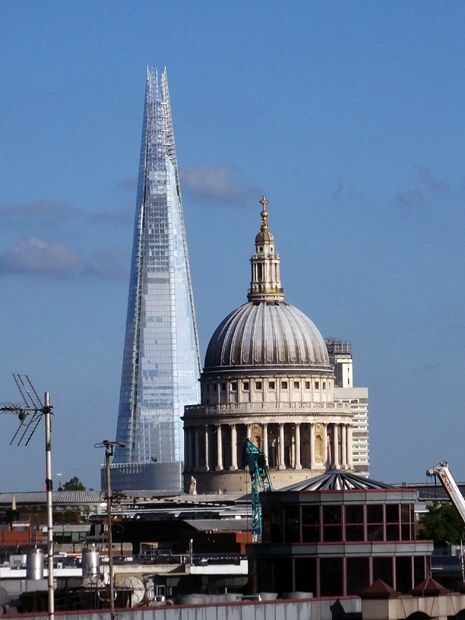 This rather surreal apposition of a new-found London horizon line gives rise to many a vexed question, in an ongoing strategic balancing act triangulated between urban planners seeking a metropolitan status quo, fierce international investors and plain bedazzled folk – impelling the quest to protect St Paul's vistas. 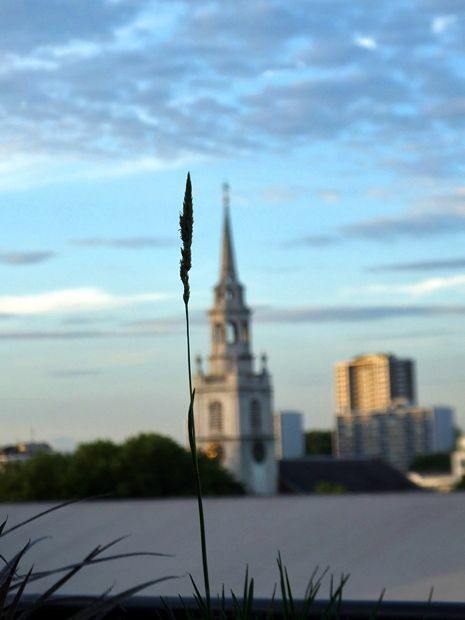 Southwark, Shoreditch, Islington, Clerkenwell and Farringdon form a spirited quintet of inspiring inner-city rooftops, interlinked aerially through historic London sightlines. Farringdon's Saffron Hill, named after a bygone Crocus commerce, forms the ward's westernmost lane, traversing north to south in parallel with Hatton Garden. Both streets are thoroughly imbued with explicit Dickensian references of Victorian sordidness, from Oliver Twist and Conan Doyle's Sherlock Holmes, to Hatton Garden's modern-day underworld folklore. 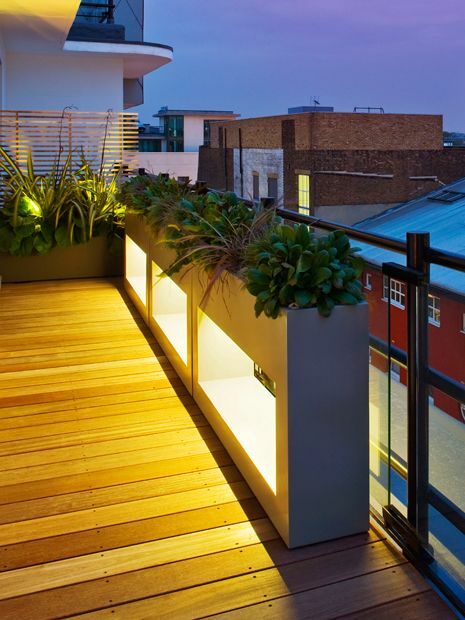 Halfway Saffron Hill, the Ziggurat Building revives ancient Mesopotamian architecture in an Art Deco style, setting an intriguing scene for our roof terrace, amid an Eastern Central locale replete with shedloads of urban nous. 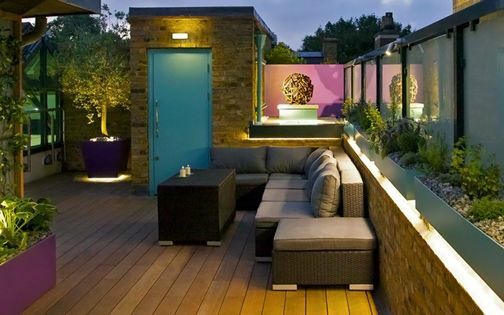 Except for a clear glass balustrade and a handy outdoor tap, the roof terrace presented an empty space surfaced in pygmy concrete pavers, where an incongruous floor material was superseded by smarter and sparklier elements in a roomier layout. The nifty lift connection from the Ziggurat's parking zone to the corridor by the apartment enabled a smooth building process, where ferrying pavers, compost bags and tools on a platform trolley condensed daily site works efficiently. 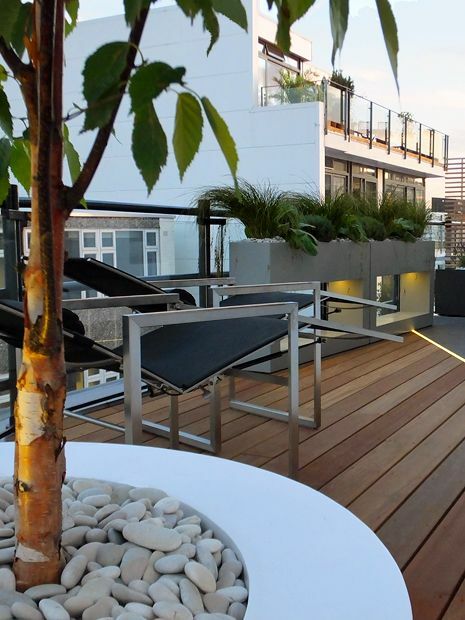 To transfer specimen trees, long deck boards and sizeable planters, we hired a small furniture lift, parked near the Ziggurat's back facade, within a commercial area abutting Farringdon Road. Unfussy, uncluttered and adamantly architectural, the roof terrace design mitigates the building's multilayered facade, a curved rooftop blueprint and an interior abundant in one-off centrepieces through a minimalist detail design. 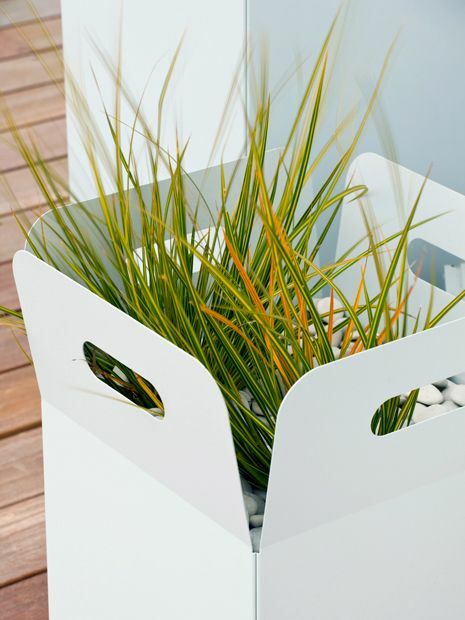 The shadow gaps between surface segments, within privacy screens and below tall planters articulate streamlined simplicity in an uncompromising layout, enveloped by the containers' silky powder-coating. A warm-toned materials palette aptly sustains a correlative dialogue with the gleaming white of the Ziggurat's external fabric, forging a highly defined focal plane in its contrastive narrative, where textured granite, dainty grasses and smooth pebbles maintain clarity and balance amid large-scale focal points. 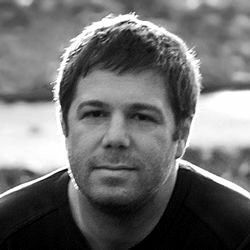 Between wildlife trekking in his native Scottish Highlands and playing the piano, to practising at the bar as a talented QC in Holborn close by, our myriad-minded client relishes Farringdon's down-to-earthness, in keeping with a fiercely pragmatic disposition. 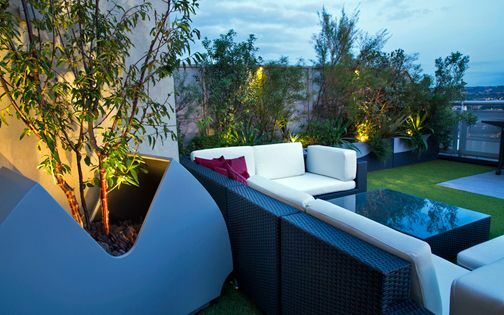 We followed suit with a low-maintenance hard landscaping scheme, culminating in Crystal Black granite units. 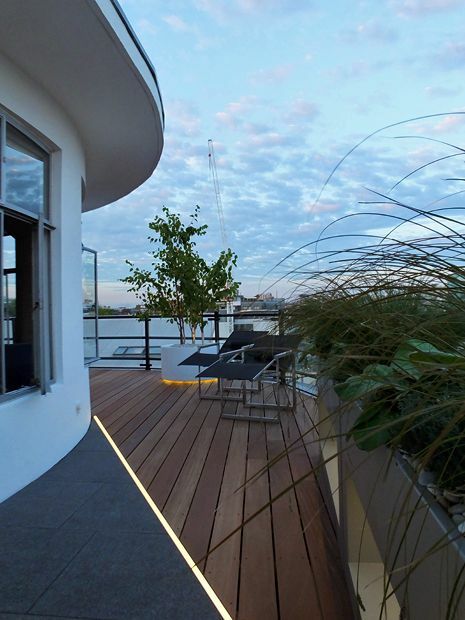 This sparkly paving material is highlighted by an LED strip light traversing diagonally in the south-facing lounge, where rectangular flagstones twinkle in both diurnal and nocturnal light, arranged perpendicularly to the deck – expanding sense of depth. 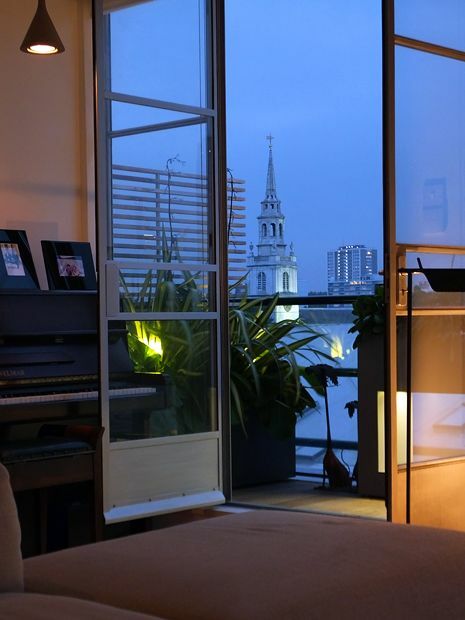 The roof terrace's south-eastward panoramic perspective embraces vistas of St Paul's Cathedral and Old Bailey, grandiosely backdropped by the Shard, alongside an architectonic City of London matrix which dissolves its effervescent glow into Clerkenwell's serenely picturesque St James's Church. 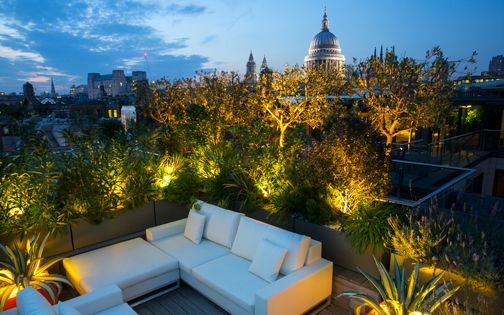 Facing west, amid sprawling aromatic herbs, silken grasses and redolent English Lavenders, the seating area maximises the rooftop's broadest curve to facilitate glorious sunbathing, alfresco dining and night-time landmark gazing. 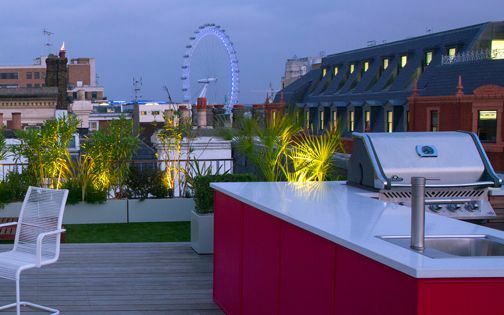 The space-saving sun loungers condense into dining chairs, enabling ergonomic efficiency in a rather compact yet socially engaging Farringdon roof terrace. 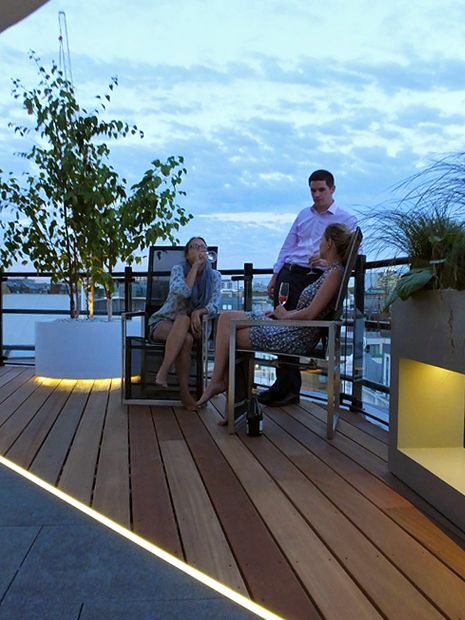 To accompany the design's triad of geometric forms, the roof terrace lighting accentuates linear, circular and rectangular outlines through innovative LED lighting techniques. 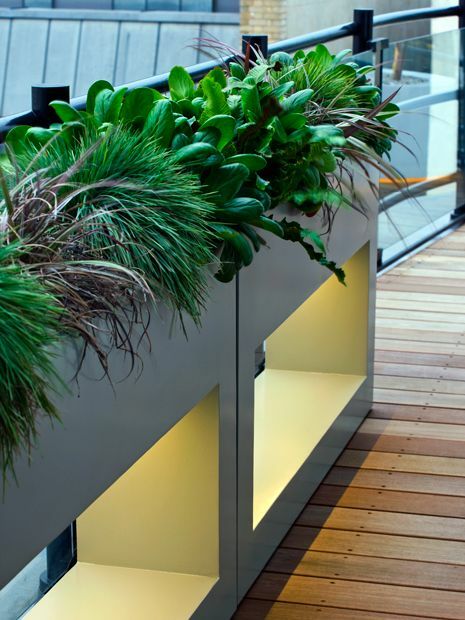 Apertured and floating planters, alongside punctuated surface lines, are utilised en masse to extend nightly ambience with a remote-controlled system of light-emitting diodes specified in discreet channels, ropes and tapes. 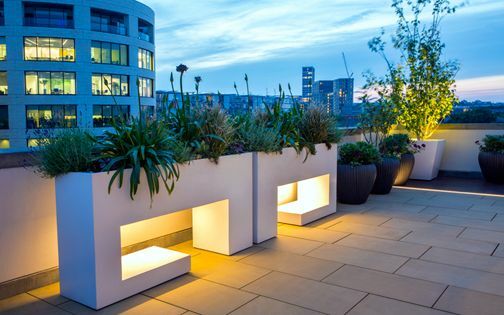 Diffused by semi-opaque covers, concealed below planter plinths and integrated into bespoke troughs, the terrace's high-spec illumination engagingly focuses on the dynamic interplay between light source fluidity and enhanced views towards a built-up city landscape predominated by the Shard's stately mosaic of banded lights. 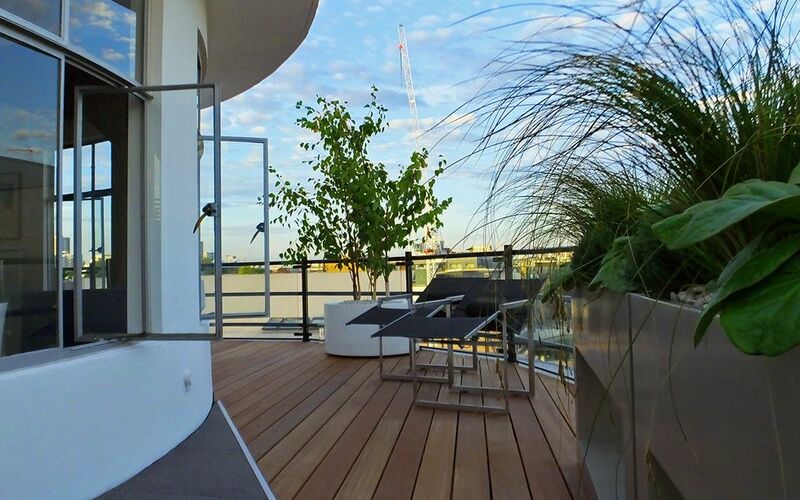 The hardwood deck, detailed in 6” boards, expands depth along a narrow walkway by the living room door, wrapping around the roof terrace to lead a rhythmic sequence towards a black granite paved area. This decked layout maximises sense of space within the small roof blueprint, further weaving richness of tone which connects into the interior's wood flooring. 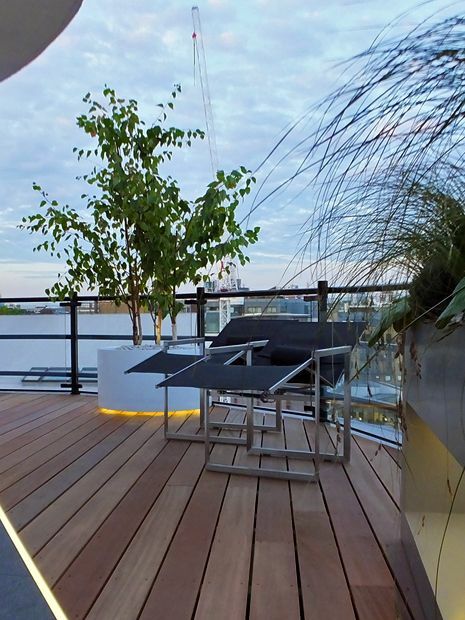 While planters reiterate the lustrousness of nearby steel cladding and glass, the decking echoes Farringdon's yellow brickwork, and instils a pivotal balanced pattern beside the apartment's continuous white curvature and Ziggurat's contours. Although etymologically ferny, Farringdon's densely dwelled quarter isn't necessarily a green place, yet its mid-rise roof terraces gradually drape an inner-city zone with sprawling architectural gardens. 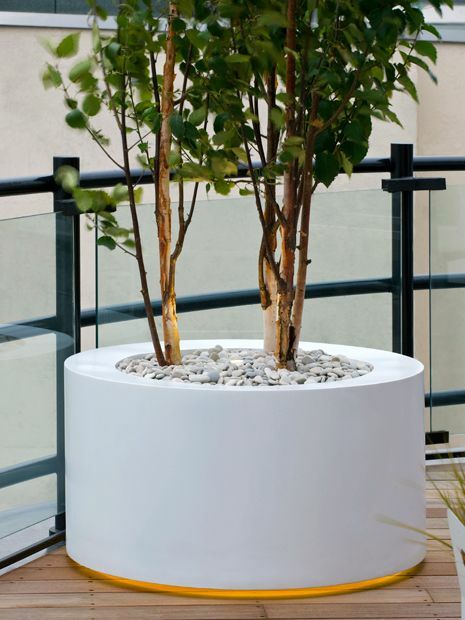 Here, in Saffron Hill, we selected ten plant cultivars to complete a minimalist low-maintenance design, where Chinese red birch, orange grasses and Thyme produce an Asian-Kiwi-Med textural blend. 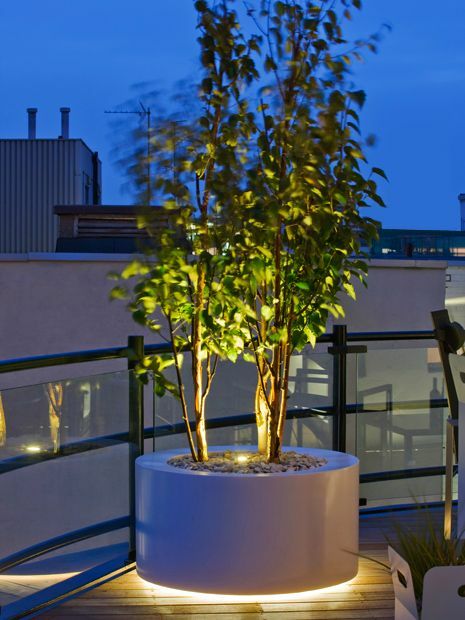 Three single trunks of Betula albosinensis ‘Fascination’ emanate from a floating circular planter, reciprocating brightly with their antecedents atop Cromwell Tower, planted previously for a Barbican rooftop terrace. 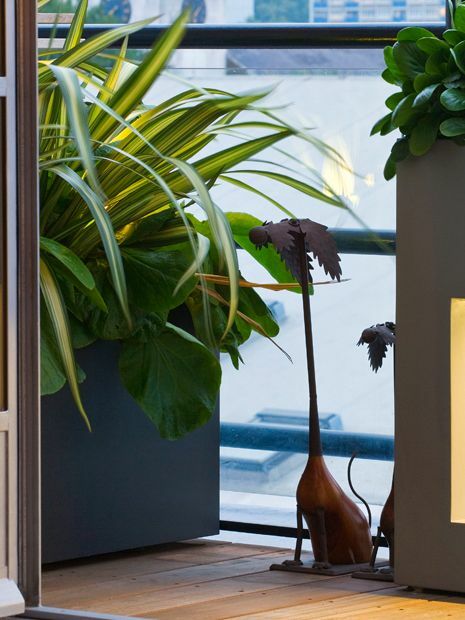 Native Hart's tongue ferns give homage to the genius loci, as sciophytes along the north-facing border gaze at sun-kissed heliophytes across the south elevation to form a truly metropolitan roof terrace planting scheme. 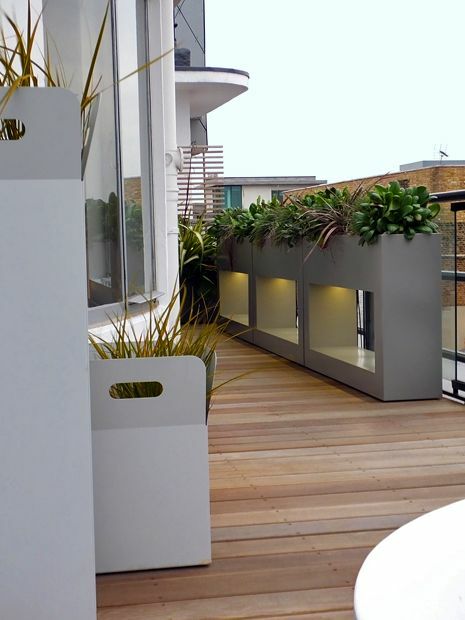 The design's monochromatic palette subtly gradates the Ziggurat's minimalist stucco and concrete framework from taupe to umber-grey through natural hardwood, granite and a unique series of bespoke powder-coated rooftop planters. 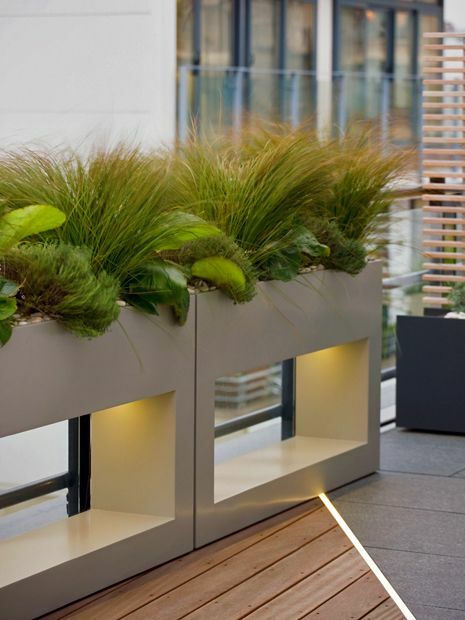 This neutral canvas further flatters the green glass expanse generated by an office block opposite, and elevates glaucous, deep-green and dark-leaved foliage, while founding a robust setting for radiant lighting. Half dozen troughs articulate this architectural mindset, delineated with apertural sable planters and a 1-metre circular tree tub. 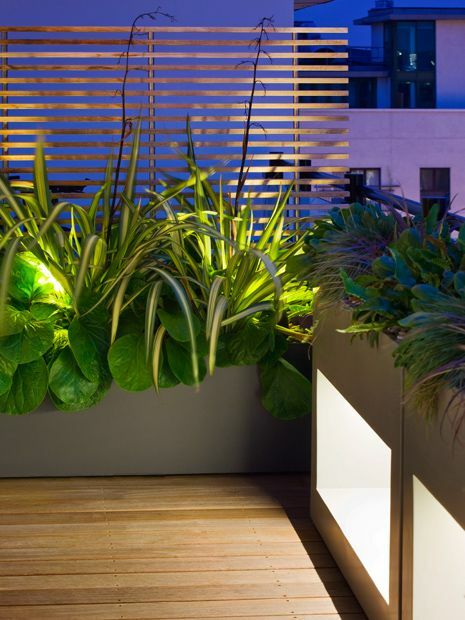 Augmented by rectangular receptacles along the terrace's far ends, fitted with privacy screens, the planter design celebrates amplified light in both natural and man-made forms. While Farringdon Road continues to develop at an unequivocal pace, its roof terraces intermesh progressively to form a leafy matrix. Both Clerkenwell and Farringdon in London EC1 maintain their foothold in the few remaining strongholds of mid-rise authenticity, where some sense of community and private outdoor breathing space bare sheer metropolitan acumen to neutralise an urbanscape of architectured duskiness. 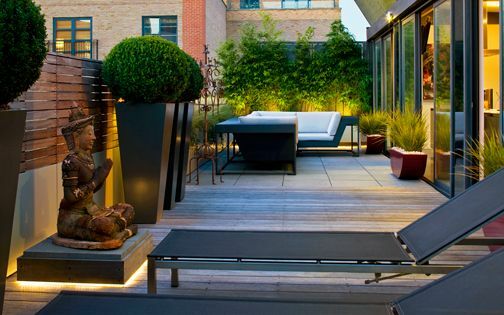 Given skyscraping living is all but a foregone conclusion, forging a disconnected make-up citywide, where outdoor spaces are virtually non-existent and plant cultivation in hopeless conditions verges on futile, the essentiality of this Farringdon roof terrace and its generation continues to express autonomy and pertinence as a pedigree of intimate and thoroughly original London roof terraces!